When you are looking for a job and have created the perfect resume, then it may also be time to write a cover letter. For many people, writing the cover letter is much more difficult than the resume. The resume almost becomes a list, whereas the cover letter has to tell more of a professional story and elaborates on the resume. 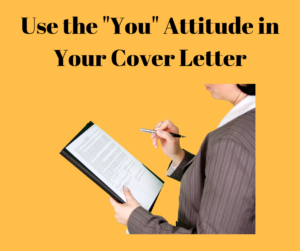 One of the keys to a successful cover letter is incorporating the “you” attitude – read further for specifics on HOW to incorporate this into your next cover letter. Tip #1 – Make it about the employer. Instead of thinking about why you want the job, think of what you can bring to the organization. Is it your teamwork abilities? How about your project management expertise? What are you going to do to make the employer’s life easier? Tip #2 – Do NOT start every sentence with the word “I.” When we write a cover letter, it’s typical for most of us to think in terms of “I can offer my leadership skills to the company.” Or, maybe you think “I’m a great leader who gets along well with others and I can make an impact with the company.” Instead, try to minimize the use of the word “I” in your letter. Consider using sentences like “Your company could utilize my leadership skills, project management abilities, and focus on collaboration.” Or, you may be able to start the cover letter with “Your recent posting for an Educational Assistant greatly interested me.” By using words like “you” and “your,” you are making the cover letter about the employer. Tip #3 – Show that you researched the company. Within the cover letter, mention the company’s recent award, how they were named a best employer within their industry, or that you understand their target market. This shows that you care about the job opportunity and know what the company is seeking in its employees. If you are still struggling with your cover letter and want to know how to better position your skills, experience, and future goals, please contact me today at heather@feather-communications.com. I can give you a free cover letter review and offer ideas for improvement. If you haven’t been on a job interview for a while, it’s a good idea to practice and prepare for today’s job market. 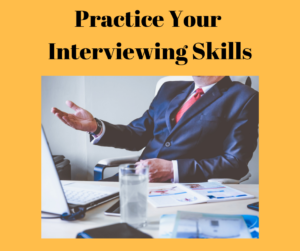 By reviewing your answers for typical interview questions, ensuring your wardrobe is up-to-date, and identifying your top skills, you will be ready to WOW the interviewers and your potential future employer. Tip #1 – Provide a 60-second synopsis of your work and educational history. Most interviews start off with the interviewer saying, “Tell us about yourself.” Why this may seem like a simple question, it can be difficult for people to describe themselves within this time frame. Don’t talk about your personal life; instead, focus on your work history, how it aligns with the job opening, and any education or certification that provides you with skill-sets that are necessary for the position. Tip #2 – Know your top three strengths and skills. Be able to recite these and give examples of how they have helped you be successful in the past. It’s one thing to mention your leadership skills; it’s completely different to mention your leadership skills and then discuss how you led a team of 35 individuals in developing a three-year strategic plan. Be specific and provide quantitative information when possible. Tip #3 – Check your dress code. Remember that this is your first impression with the organization – it is much better to be over-dressed than under-dressed. If you don’t have an updated professional outfit, remember that you don’t have to spend a fortune; check your local thrift stores to find pieces that can be combined for a suitable interview outfit. Tip #4 – Know the company. Research the company so that you know it’s target customers, top clients, how long it’s been in existence, and approximate number of employees. More than likely, one of the questions during the interviewer will ask you what you know about the organization. Tip #5 – Trace your route. If your interview is in-person and you have never been to the company before, be sure you know where you are going and how long it will take you to get there (including potential traffic). That may mean a practice drive to the company to gauge the trip. It’s much better to do that ahead of time than to run late on the date of the interview. While it is vital to practice your interview skills, please remember that you don’t want to sound rehearsed and mechanical. Instead, keep several main ideas in-mind and use those as talking points during the interview. Also, one last tip – FOLLOW-UP after the interview. Send a thank-you email or card and be sure to thank the interviewers for their time. Often, it can be the tiny things that set you apart from the multitudes of other candidates. If you are ready to move forward with your job search, email me today: heather@feather-communications.com! As you embark on your job search, you start looking at online sites and organize your information for a knock-out, fantastic, and focused resume. Then, you really start to read what the companies are looking for and discover that some of them ask for a cover letter and some don’t ask for anything except the resume. So, you wonder…do I actually need a cover letter? Or, can it just be skipped? I tell all of my clients the same thing – it’s better to have a cover letter and NOT need it versus needing a cover letter and not having one. The cover letter provides you with an opportunity to tell your story further and explain more than you can discuss in a resume. And, sometimes there are extra achievements that you may want to include in your resume and simply can’t fit into the document. Instead, you can add those ‘bonus’ items to the cover letter. It’s important that you tell the reader something new in your cover letter and don’t just reword the resume. Next, a cover letter can also be used as an introductory email. That means that even if the company doesn’t have a requirement for a cover letter, you can add it as an ‘extra’ document or use it in the verbiage of your email. Again, it provides a nice introduction to you as a job candidate and offers a warm preview for your resume. Finally, your cover letter gives you an opportunity to showcase your written communication skills. Effective communication is a vital part of any job today; demonstrating that you know how to discuss your strengths and accomplishments in a confident manner allows you to present yourself as the right candidate for the position. 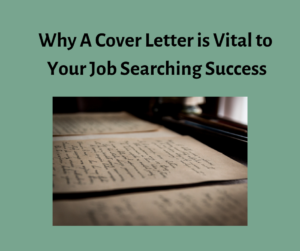 Even if a cover letter is not required, it provides you an extra opportunity to go above-and-beyond during this initial stage of connecting with the company. If you KNOW you need a cover letter and just don’t know where to start, check out my free Cover Letter Checklist Tips – you will learn several ideas that will help you make an impression as you search for your new job. As you create your new resume, you start to gather information and identify where you worked, the dates, the official names of your degrees, and your professional affiliations. If it’s been 10, 15, or 20 years since you last wrote your resume, it’s vital to know that a skills section is a MUST-HAVE in today’s job search. This serves as an easy way for you to highlight key words and strengths. However, many people struggle with how to identify these skills. Read the tips below for ideas that will assist you with your new document. Tip #1 – What comes easily to you at work? If you are in sales, can communicate with client easily, and know to establish rapport, then those are your skills. The things that come naturally to you with your personality and little effort are your innate skills. For me, it’s writing. It just comes easily to me and I know how to word things. For an accountant, it’s probably that they are detail-oriented, focus on analytics, and know how to problem-solve payment discrepancies. Tip #2 – What would your boss or co-worker say about you? For many of us, it’s just not natural to think about how wonderful we are on a daily basis. So, instead of asking yourself your strengths, think in terms of your boss or co-worker. They may say you are organized, a good leader, can manage projects, and always adhere to deadlines. Once again, those are your skills and competencies. Tip #3 – Focus on key words. No matter your skill-set, you must be sure that your verbiage aligns with the job posting. What does that mean? It means if you list ‘project management’ as a skill and the job advertisement asks for someone with ‘project leadership’ skills, then you need to change your skills are to say ‘project leadership.’ If you make this section succinct bullet points that can be easily changed, then it will be fairly simple to make modifications as you go forward with your job search. Whether you call this section, skills, competencies, areas of expertise, or qualifications—they are all the same. It’s an area designed to make you stand-out and match key words to get to the interview. If you are still confused about adding a skills section, please contact me. I would love to provide you with tips and ideas for an improved document! Your Resume Should be Relevant – Don’t Include Everything! 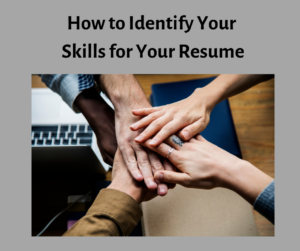 If you have decided to rewrite your resume, you are probably gathering information, getting organized, and trying to find that old resume file. And, as you stare at the piles of paper, different files, and past job reviews, you are now trying to decide which information to include and not include while also ensuring it’s in-line with today’s search engines and job openings. Tip #1 – Don’t include ALL of your job history. If you have been working for 15 or 20 years, the jobs earliest in your career are most likely not relevant to future positions. For example, during high school, I was a bank teller and cleaned hotel rooms on the weekends. That was almost 25 years ago; therefore, not relevant to potential employers. Tip #2 – Consider adding or not adding your side business. If you are in direct sales and use that as a “side hustle,” you will have to determine whether or not that is relevant to the job opening. If you are seeking a sales position, it may be relevant as you are good at building relationships, establishing communication, and managing accounts. If you believe the employer may see your side business as a distraction, then don’t include it on your document. Tip #3 – High school is not important if you have a college degree. If you attended college or graduated with a degree, the high school information does NOT need to be on the resume. Tip #4 – Work history in two separate industries. Maybe you used to be in sales and you are transitioning into varied accounting roles—then focus on your accounting positions first and put your marketing work history in a separate section. Focus on the types of positions that are relevant to the jobs you are seeking. Tip #5 – Hobbies aren’t that interesting. Many years ago, people included hobbies on their documents and indicated interests such as running, traveling, and spending time with family. Unless you are a hiker and you are applying at a company that makes hiking shoes, it’s not relevant. In fact, sometimes hobbies can appear to actually pull your attention away from work. 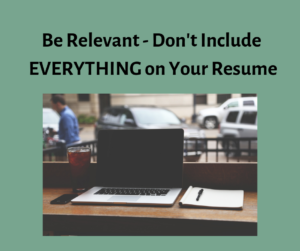 Relevance is key when you are working on your updated resume. It shouldn’t read like a laundry list of every single thing you have ever done in your professional career. So, before you add more information that may not be relevant, think it through and remember that hiring managers make decisions quickly about who to call-in for interviews. Get to the point quickly and ensure you make it through to an interview so that you can WOW the employer with your skills and knowledge. As with many of my clients, most people often feel like they are sending resumes to perfect job opportunities. But, they get discouraged quickly when they do not get call-backs for any interviews. It’s frustrating and they start to believe that maybe they don’t the correct skills and qualifications for today’s job market. 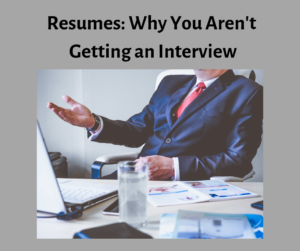 There could be many reasons why they aren’t getting interviews; I can almost guarantee that SOME of it has to do with your resume. Reason #1 – Your resume format is OLD. Maybe you haven’t updated your resume since 1998 and the last time you applied for a job, you physically went to the place of employment and applied in-person. Today, that almost never happens as all companies post jobs on their company websites and/or third-party websites. If you have an Objective on your resume, still have the line, “References available upon request,” at the bottom, or are including any personal information, you may want to rethink your format. Don’t waste space with an Objective or useless information; instead, focus on what you can do for the company and pertinent information that aligns with the job opportunity. Reason #2 – You Aren’t Including Key Words. Because you are applying online, the key words are your golden ticket to getting through the Applicant Tracking System (ATS). This means that your resume MUST contain the same words as the job posting. When you read through the job opening, look for the qualifications, knowledge, or responsibilities sections. Then, make sure those skill-sets are the same ones listed on your document. Obviously, don’t include skills that you don’t have or can’t back-up during an interview; but, if you have to change Project Management to Project Leadership, then do it. Reason #3 – You didn’t proofread your resume. So, when a hiring manager or recruiter receives hundreds of resumes, they immediately start looking for a way to weed people out—they are NOT looking for a way to include more people as candidates. Be sure to review the document prior to sending it to prospective employers. Do NOT strictly rely on spell check or grammar check; instead, review it a couple of days after you have ‘finished’ it. Then, my recommendation is still to have a trusted friend or colleague review it for you. Often, someone else can more easily recognize our errors than we can. Don’t let a spelling or grammar error move your resume to the NO pile. If you would like more resume tips, click HERE to download my number-one FREE offering!